Trend-setting restaurants, Northwest cookbooks, local food news and the people who make them happen. Not to be outdone by her Wallingford neighbors Rachel Yang and Seif Chirchi of Joule (who last week divulged plans for a second, more casual restaurant), Iron Chef-champ Maria Hines today announced her intentions of opening a sibling for Wallingford’s Tilth: address and debut-date to be determined. With investors in line, Hines has her eye on the North End, and a turn-key space that she can turn around fast. Her wish list includes proximity to Tilth, and seating for fewer than 60 patrons. “I don’t want to drive south of the Ballard Bridge or east of I-5,” says the Crown Hill resident. Nor does she care to build-out a new restaurant, a la Scott Staples, whose third venture is presently under construction in Fremont. Fremont’s in her sight-line, along with Ballard, Wallingford, Phinney Ridge and Greenwood. “I’d love to have another restaurant tucked away in one of those sweet little neighborhoods up here,” Hines says. 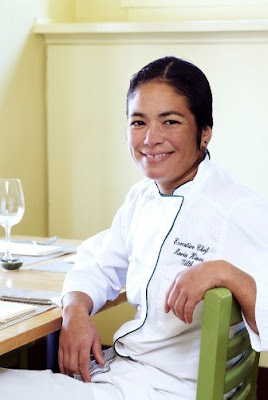 Maria Hines at her certified organic restaurant, Tilth, in Wallingford. The chef envisions the new place, dubbed Golden Beetle (named for one of the classic components of the spice-blend ras el hanout, and considered an aphrodisiac), as an “upbeat, fast-paced” gastropub with an Eastern Mediterranean focus and a North African accent. “The flavors are going to be big,” she insists. “Hot-spice, earth-spice, salty, crunchy, sweet, sour.” As at Tilth, the menu will be 95-percent certified organic. She’ll turn to the cuisines of Turkey, Egypt, Lebanon, Tunisia and Morocco for inspiration. And to friends like Poppy’s Jerry Traunfeld, who has “stepped outside of the box,” she says, to go beyond the New American Cuisine that earned each of them “Best Chef” awards from the James Beard Foundation — and a world of national attention. For now, she’s putting her focus on nailing down the right location. “Once I lock down the space, negotiate, and have the keys in my hand,” Hines says, the new restaurant should be open in a month or two. Bethany Jean Clement is The Seattle Times food writer. Her writing has also appeared in Best Food Writing, Food & Wine, Gourmet.com, Beard House, Town & Country, Edible Seattle, The Stranger and more. Follow her on Twitter: @BJeanClement. Providence Cicero is The Seattle Times' restaurant critic. Reach her at providencecicero@aol.com. Tan Vinh is The Seattle Times’ Happy Hour writer. On Twitter @tanvinhseattle. Rebekah Denn, a former restaurant critic, is a freelance food writer for numerous publications. Brian Thomas Gallagher is a Seattle Times assistant features editor.